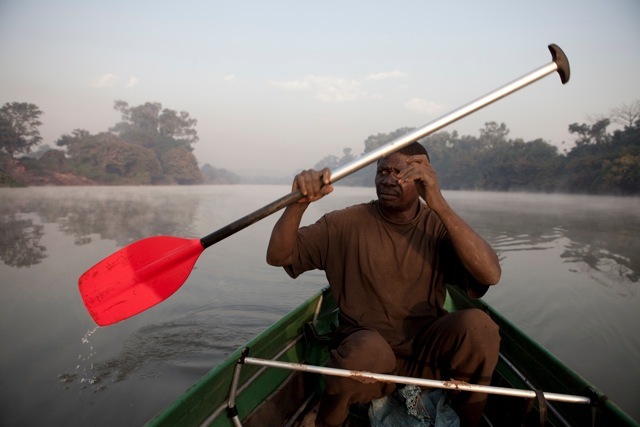 Dangerous spoke with Jason Florio before and after he and his wife, Helen Jones-Florio, descended nearly the full length of the River Gambia earlier this year. Originally funded through a Kickstarter project, the expedition was an effort to raise awareness of the region, the river, and the potential damming of the river. 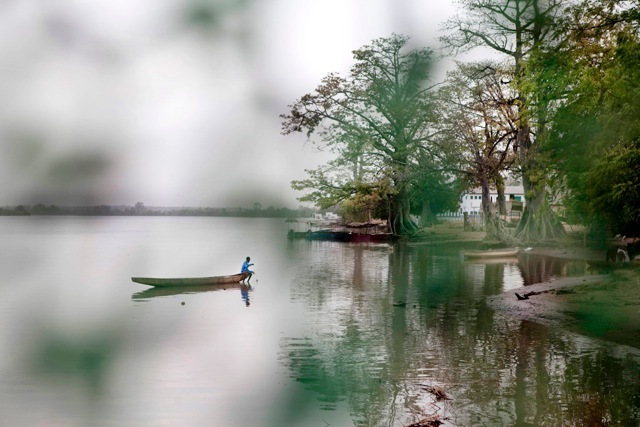 The story written prior to the expedition appears at the bottom of the page..
Jason Florio and his wife, Helen Jones-Florio, have made one of the few full-length descents of the River Gambia. 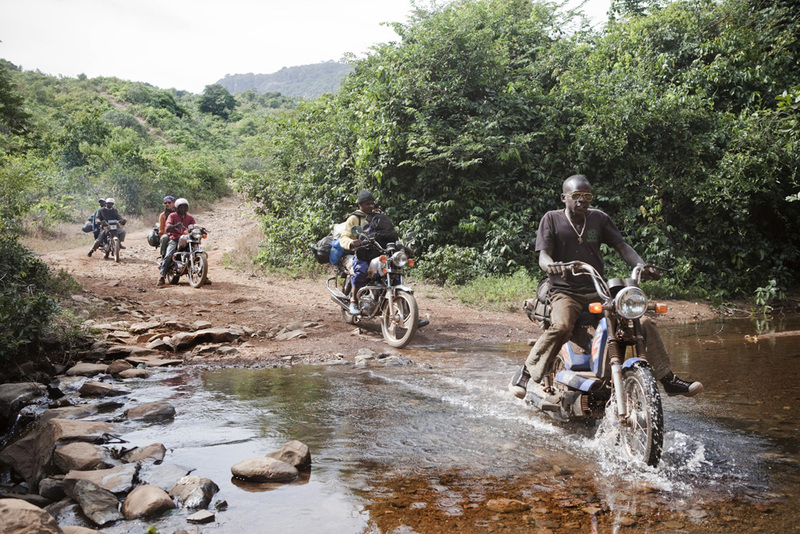 From November 23, 2012 to January 21, 2013, the two traveled 649 miles (1,044 kilometers) by motorcycle, truck, and folding canoe from the river’s source at Hore Dimma in the Guinean Highlands to the Atlantic Ocean at Banjul, Gambia. The upper stretches of the river are unnavigable with a canoe loaded with two months’ of supplies. 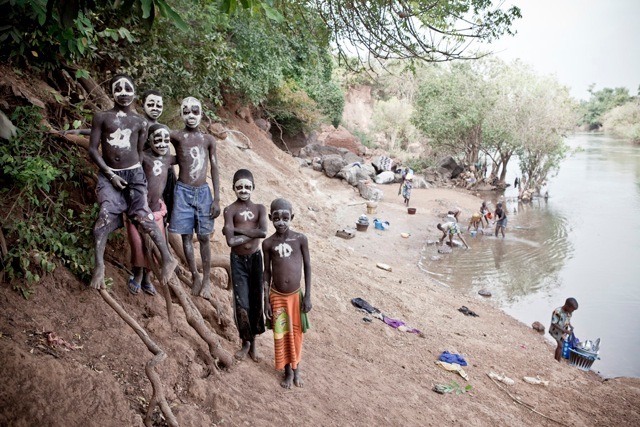 From the source, the Florios bumped and pounded and slid down more than 200 miles of muddy mountain roads on motorcycles and four-wheel drives to the stashed canoes in Kédougou, Senegal. From there, the journey was a lesson in paddling, river navigation, and negotiating with hippos and Gambian guides. Generally speaking, neither Florio nor his wife are workaday adventurers, though they’ve accumulated an impressive résumé of international trips and expeditions. Dangerous spoke to Florio in October prior to his traveling to Africa. We talked about his preparations, his motives, all the shiny new gear he was about to punish, and the River Gambia’s colorful reputation: crocodiles, poachers, unnavigable rocks when the river runs low. Jason on the banks of the Gambia. 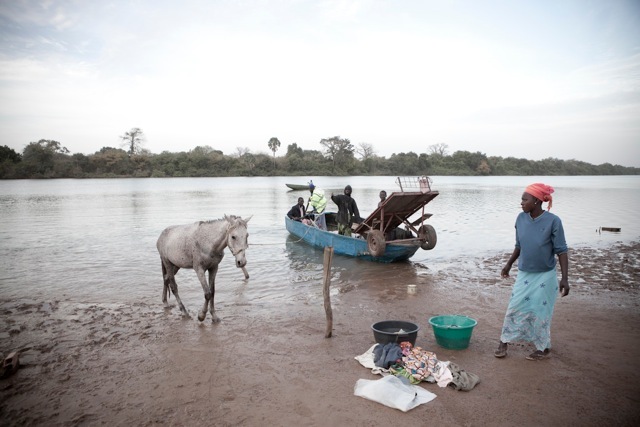 One of the goals of the expedition was to document the River Gambia in its entirety—one of the last remaining undammed rivers in Africa. The other goal was just to pull the whole thing off. To time the expedition with the end of the rainy season for navigable flows and clearing weather. To avoid the crocodiles. To avoid the poachers. To keep the digital hardware clean and dry. And they succeeded. Destroyed electronics aside (including a video camera owned by Dangerous publisher Robert Young Pelton), there were few losses. It was an African expedition rife with the sort of wonders, hang-ups, thrills, dangers, delays, and frustrations that you’d expect. But at the end of the day, the Florios brilliantly executed a full-length look at the wild River Gambia. The “guys” were the two Gambian guides the Florios hired to aid in the descent. They were fishermen. One was an older, traditional man, about 55. “Praying-five-times-a-day-type traditional,” Jason says. The other was a younger man, who, instead of praying, would try to access the Internet on his smartphone. The trip was a chance for the two men to see the full course of the river that has served as their people’s lifeline since time immemorial. But they also had a job to do. The Florios were relying on the two for local information, help with border crossings, and procuring food, through fishing or otherwise, on a daily basis—the usual tasks expected of a guide. But not these guys. These guys had never fished in fast water like that of the upper Gambia. Neither did they pack any fishing gear. And then on Christmas Day they threatened to quit after a hard day’s paddling. It was too difficult, they said. They didn’t know the river, and they were scared of hippos and crocodiles. 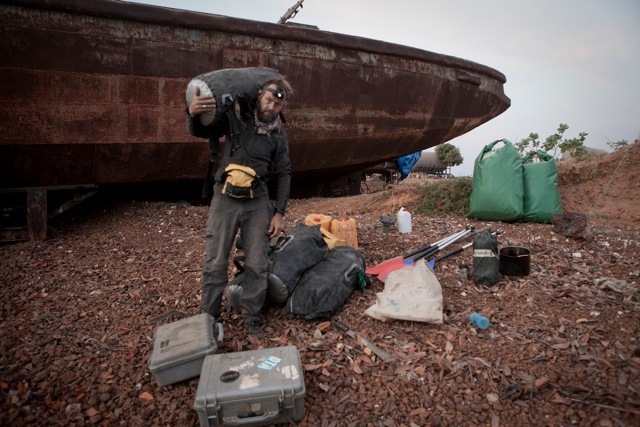 On the banks of the Gambia, they had a meltdown halfway through the expedition. A two-hour argument ensued. The Florios neared the point of saying, Hell with these guys. But the guides decided not to quit, partly, the Florios feel, because the two men would have been shamed by turning from a task that a woman (Helen) was confronting. The guides agreed to continue to the Atlantic, and “after that they were fine,” Jason says. There were other delays and mishaps, and, not surprisingly, each bend in the wide, brown river offered its own set of problems. They made between 18 and 25 miles a day. And while the two guides can add fast-water fishing to their list of skills, the Florios can add paddling a canoe to theirs. Beforehand, they tested their folding Ally Canoes by paddling between riverside pubs in England. About all that did was help them recognize the boats when they arrived in Gambia. Nothing like an African river to break in a rookie canoeist. They learned how to read the river currents, to read the wildlife. They lashed the boats together for stability and put up a makeshift mast in each. Their hands calloused and their shoulders hardened. “He’d had a couple of run-ins with hippos, so we knew he wouldn’t be reckless,” Jason says. As it turned out, local people at each section of the river had their ways of dealing with the wildlife. A handheld catapult loaded with rocks was one of the more effective ways to keep hippos at bay, which can weigh up to 9,000 pounds. The River Gambia is mostly a slow, gentle river. But swift currents and waves that threatened to swamp the boats could make paddling difficult. The only time the Florios had to drag the canoes was at the river’s mouth—a nine-mile-wide braided channel of sandbars, chutes and levees that empties into the Atlantic. Though bungled West African politics have so far kept a dam on the River Gambia from happening, if it ever becomes a reality, the river and the landscape, including the people, will be forever changed. The Florios are quite possibly the only ones to have seen every foot of the river, and they’re preparing an array of media gathered during the descent to draw attention to the river, the people, and the land. The descent of the river won’t easily be replicated. Partly because finding the source of the river was no easy feat. The Florios were relying on a 19th century French explorer’s account to find the trickling rivulet, and before they departed for Africa, they considered it a solid, albeit old, source of information. Local knowledge turned out to be much more helpful, and after finding the source, they filled a bottle with the clear water. To pay for the expedition, Jason is selling prints of the journey, the people and life on the river. His photographs from his previous trip to the Gambia garnered awards and applause, and the latest batch looks to be just as successful. You can see more of Jason Florio’s photographs from Africa and elsewhere, and purchase photographs, at his website. Visit the River Gambia Expedition blog HERE. To read the first installment of our Down the Gambia story, click HERE.